As teachers of English as a second language (L2) in web communication, our aim is to help L2 students improve their spoken and written English language skills. Teacher feedback has been shown to do this in some cases. However, only using teacher feedback can put huge pressure on the teacher, both in terms of time and resources. This paper describes and discusses our attempt at introducing peer feedback as an additional way of providing students with feedback on their English writing. Before conducting this study, we did not know if peer feedback would be feasible in our teaching environment or whether it would benefit the students and teachers. Our aim was to establish a status quo of our students’ abilities in providing and implementing peer feedback. We introduced peer-feedback tasks and focused on the types of feedback provided by the students, the phrasing of the feedback, both when implemented and not implemented by the students, and the types of revisions made by the students. Our findings allowed us to develop peer-feedback process guidelines for web communication as a way towards improving written feedback processes in higher education, and hopefully for others to adapt and implement in their own communication classrooms. Flanagan, Marian, und Carmen Heine. 2018. Improving English L2 Writing in Web Communication: Can Peer Feedback Help?. 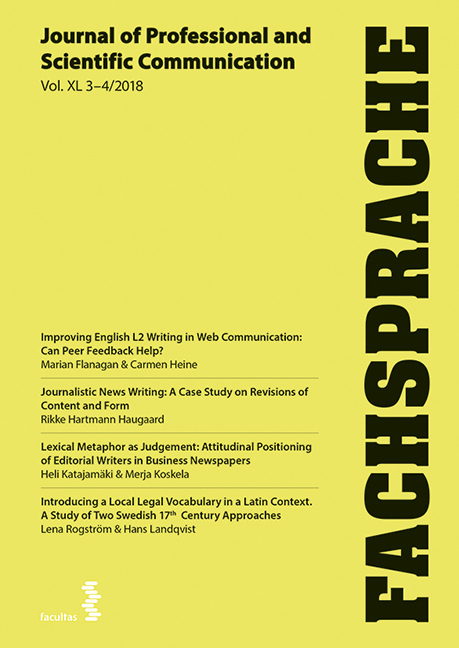 Fachsprache 40 (3-4), 94-121. https://doi.org/10.24989/fs.v50i3-4.1712.